11,632 Swarovski Crystals And 8 Hidden Words: The Making Of Priyanka's Ralph Lauren Gown! Going by the caption, the bespoke wedding gown was embedded with 32,000 pearlescent sequins, 5600 seed beads, and 11,632 Swarovski crystals. Fifteen artisans from Mumbai hand-embroidered the gown for more than 75 days and only then the stunning masterpiece was created. The sheer coat that the actress wore above the strapless column dress was crafted using complicated techniques like fine cording, tulle appliques and pastiche threadwork. The front-closed coat had 135 satin covered buttons and had scalloping finish on the neck and on the ends of the sleeves. The show-stopper was not the pearls or the sequins but the insanely romantic messages that hid in it. The words Compassion, Hope, Love, Family, and the Hindu mantra Om Namaha Shivay were embedded on the gown. On the front of the coat was Nick's full name (Nicholas Jerry Jonas) and on the back were the names of the bride's parents. The gown had the couple's wedding date ( 1st December 2018) etched in ivory thread work. Sewn into the pattern was also a piece of lace from the wedding dress of Nick's mother. In the words of the designer, "This isn't about a dress. It's about a woman and a moment. 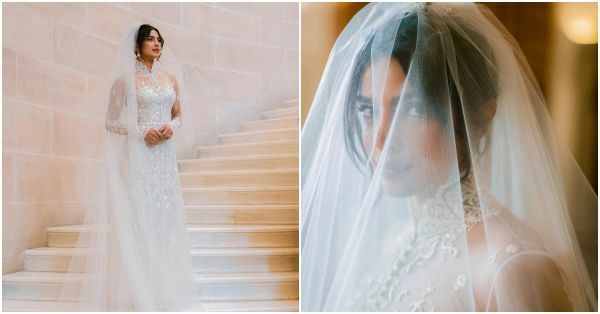 Priyanka knows exactly who she is and so I wanted the dress to reflect not only her love story or the romance of India but also her unique sensibility: Strong, smart, and beautiful." The second video shows the making of the sweeping 75-foot veil. It comprised of two different cuts of tulle wore one over the other and held behind the bride by six attendants. Several B-town celebs got married this year, but we think Priyanka's gorgeous look made her shine the brightest on her big day.